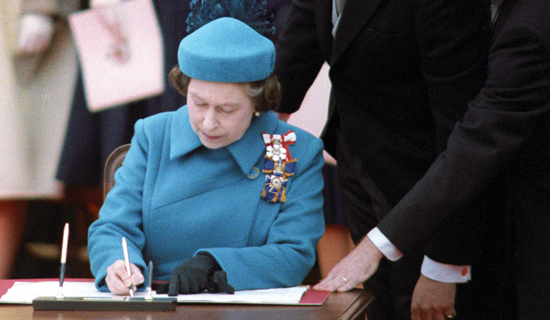 After 50 years of intermittent effort, Canada finally achieved the patriation of its written constitution in 1982. “Patriation” meant primarily that the Parliament of Canada and the provincial legislatures as required could now amend its own constitution through a new all-Canadian amending formula and that the British Parliament no longer exercised any jurisdiction whatever over the amendment of Canada’s written constitution. The Statute of Westminster, 1931 marked the formal and legal independence of the Dominion of Canada, but our written constitution remained an act of the British Parliament until Patriation; as such, the British Parliament had to amend Canada’s constitution on the advice of the Canadian Parliament. Canada could have patriated as early as December 1931 with the passage of the Statute of Westminster, but our federal and provincial governments and parliaments could not agree on a suitable amending formula. We decided to leave the amendment of our written constitution to the British Parliament by default, as a neutral position until devising a new indigenous amending formula. Other former Dominions never experienced this problem. From its establishment in 1901, the Commonwealth of Australia possessed an indigenous amending formula that it still uses today. New Zealand, as a unitary state, can amend its constitution by an act of its Parliament. However, Canada’s founders clearly wanted the British Parliament to possess the power to amend the British North America Act, 1867. This arrangement therefore might have been a mistake, but it was no oversight; it was deliberately put in place. By the 20th century, however, Canada needed to change this procedure. In 1982, Canada patriated the British North America Act, 1867 and renamed it the Constitution Act, 1867. Canada also established another crucial pillar of its written constitution, the new Constitution Act, 1982. Through the new constitution, Canada codified and affirmed many common-law rights into the Charter of Rights and Freedoms (Part I), recognized the treaty rights of aboriginals (Part II), codified equalization (Part III), finally established an indigenous amending formula (Part V), and in the Schedule included some (but not an exhaustive list) of the other Orders-in-Council and Acts of Parliament that form part of the overall Constitution of Canada. The Constitution Act, 1982 as a whole represented a significant achievement in Canadian history, but most of the commentators – including former Liberal Attorney General and Prime Minister Jean Chretien and former Liberal Attorney General Irwin Cotler – have lauded only the Charter of Rights and Freedoms with great praise and all but ignored the other components of the Constitution Act, 1982. In so doing, they have contributed to the popular and false narrative that Patriation exclusively refers to the Charter. In a recent interview with Tom Clark, Jean Chretien, the great story-teller and myth-maker, also perpetuated other disturbing misconceptions about Patriation. As a former Attorney General and Prime Minister and as a lawyer, he should have known better! Chretien asserted, “You know, we were still legally a colony of Great Britain [until the Patriation of 1982].” Chretien’s statement is demonstrably false. Canada ceased to be in law and in fact a colony of the United Kingdom with the passage of the Statute of Westminster, 1931, which established the Crown of Canada as a separate legal entity from the Crown of the United Kingdom. We cannot blame the United Kingdom for our homegrown Canadian failure to devise an appropriate indigenous amending formula until 1982! 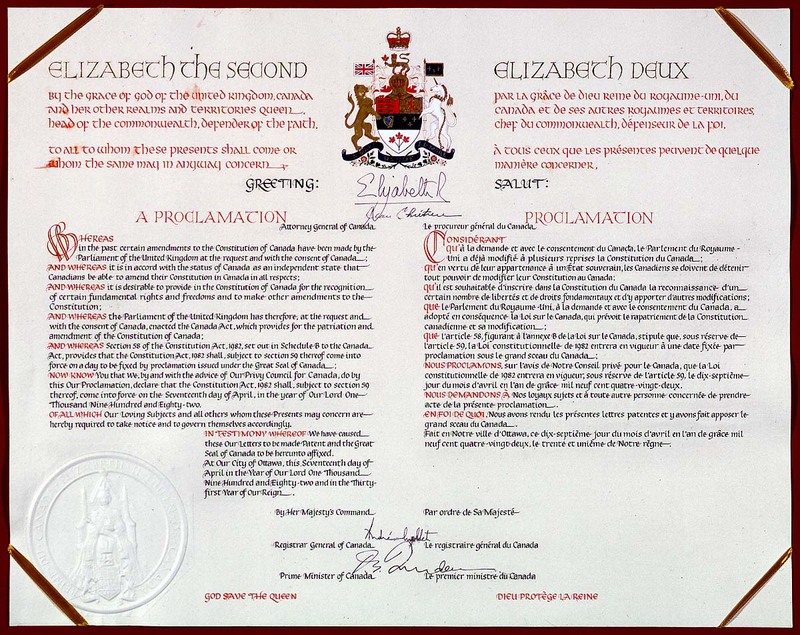 The Royal Proclamation that Queen Elizabeth II of Canada signed at the ceremony in Ottawa in recognition of Patriation even declared in the preamble, “Whereas it is in accord with the status of Canada as an independent state that Canadians be able to amend their Constitution in Canada in all respects.” The Queen of Canada thus recognized that Canada had already attained the status of independent state before 1982. The most amusing aspect of Chretien’s false statement is that he was the Attorney General of Canada when Her Majesty issued that Proclamation – and he therefore counter-signed the same document! The Charter of Rights and Freedoms did not “give us our rights” per se, as the common refrain asserts. It did give Canadians some additional positive rights on official languages. But in large part, it codified and affirmed common-law rights that Canadians had already possessed based on centuries of judicial precedent and reception of British statutes. Before the Charter, parliaments could infringe upon our common-law rights without judicial review, but these rights were still extant. The Charter imposed a significant limitation on the Blackstonian doctrine of parliamentary sovereignty for the first time by subjecting acts of parliament to judicial review and by preventing the Parliament of Canada and the provincial legislatures from passing legislation that infringed upon our basic rights, “subject only to such reasonable limits prescribed by law as can be demonstrably justified in a free and democratic society.” This Reasonable Limits Clause, Section 1 of the Charter, acts as a check and balance between Parliament and the courts in a new era of judicial review. I support the Charter and consider judicial review of potential parliamentary infringements on individual rights a healthy and reasonable limitation of parliamentary sovereignty. Parliament should not possess the sovereignty to deny someone his basic rights as a free-born Canadian. As a Whig and classical liberal, I support in principle a constitutional document that prevents all levels of government from infringing upon clearly defined, negative rights. In addition, the Charter still strikes a balance between the legislature and the judiciary through the Reasonable Limits Clause and the Notwithstanding Clause; it does not deal in absolutes. The Constitution Acts (1867 and 1982) apply to all provinces and to the federal level. The Levesque government did not agree with the Constitution Act, 1982, which frankly makes sense from their viewpoint: a secessionist party and officially secessionist government cannot realistically support an effort that would make Canada anew and reinforce Quebec’s place in the federation. Quebec did not “sign on to the constitution”, but the entirety of the Constitution Act, 1982 applies to Quebec with the same force and effect as it applies to the other provinces and to the Dominion. In conclusion, I agree with former Prime Minister Chretien that the Harper government probably should have included the 30th anniversary of the Constitution Act, 1982 in its list of celebrations of 2012 – but this commemoration most certainly should not focus exclusively on the Charter of Rights and Freedoms. We should commemorate Patriation and the Constitution Act, 1982 as a whole and the respective roles of the Trudeau government and the Queen of Canada therein, and we should celebrate integral place of the Constitution Act, 1982 and the Charter within the Constitution of Canada. The Agenda with Steve Paiken recently hosted a panel with Chretien and Romanow. Any Canadian interested in the history of Patriation, the creation of our indigenous constitutional amending formula, and the establishment of the Charter should watch this video! Irwin Cotler, “Myopic Government Ignores Charter Anniversary,” Toronto Star (12 April 2012). Global News, “If the War of 1812 Warrants Commemoration, So Does the Patriation of the Constitution: Chretien,” The West Block (15 April 2012). Canada Gazette, “Constitution Act, 1982”, 12 May 1982. Section 1 of the Charter, also known as the Reasonable Limits Clause. This entry was posted in Amending Formulas, Constitution (Written) and tagged Charter of Rights and Freedoms, Constitution Acts, Irwin Cotler, Jean Chretien, Notwithstanding Clause, Patriation, Reasonable Limits Clause, Statute of Westminister. Bookmark the permalink. 4 Responses to The Constitution Act, 1982 Includes More Than Just The Charter of Rights and Freedoms!